Two imprisoned sisters whose sentences were dropped on the condition that one donate her kidney to the other have been released from jail in Mississippi. The pair, who had been in jail for 16 years, are moving to the US state of Florida, where their family lives. Jamie Scott requires daily dialysis, which costs the state roughly $200,000 (£129,000) per year, officials said. 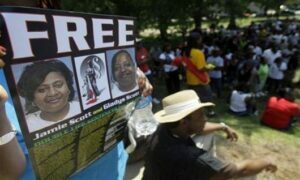 She and her sister Gladys Scott were convicted in 1994 of taking part in a robbery that netted a mere $11 (£7). Mississippi Governor Haley Barbour agreed to release the sisters, who were serving life sentences for leading two men into an ambush in Mississippi in 1993, on the condition that Gladys, 36, donates a kidney to her sister within one year. Gladys, who came up with the idea for the transplant, volunteered to donate her kidney to 38-year-old Jamie in her petition for early release.